Sweet Jamaica, my favorite place in the world! Each time I am lucky enough to pay you a visit, I take hundreds of photos. With so many beautiful sights and special memories, the choice was tough. I have decided upon a photo I took in Hanover parish, near Lucea, in 2010. 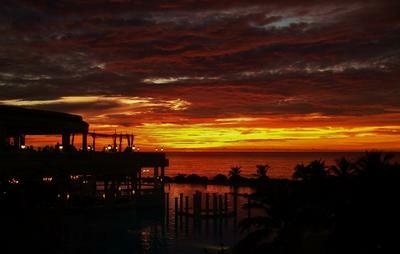 The photo not only captures one of Jamaica's famous sunsets but the romantic vibe of the island, as well. Click Here to Share YOUR Jamaica50 item too! Return to Jamaica50 Poems & Articles.